This product is no longer available and has been replaced by: AVW200. 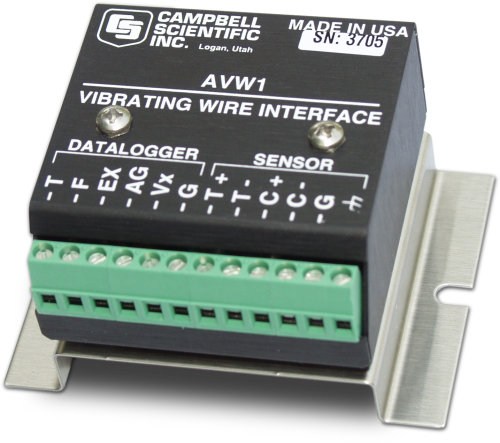 The AVW1 is available as a replacement part or as needed for continuity or compatibility, but Campbell Scientific recommends the AVW200-series interfaces for all new applications. The AVW200 interfaces are much more accurate and feature a high degree of noise immunity for your vibrating-wire measurements. The AVW1 provides amplification and signal conditioning for the frequency signal of one vibrating-wire or vibrating-strip transducer. Compatible sensors include pressure, load, strain, or even vibrating-wire temperature sensors. The recommended frequency range is 1000 to 9900 Hz (up to 5000 Hz in the CR5000). The AVW1 is available as a replacement part or as needed for continuity or compatibility, but we recommend the AVW200-series interfaces for all new applications. The AVW200-series interfaces are much more accurate and feature a high degree of noise immunity for your vibrating-wire measurements. The AVW1 provides amplification and signal conditioning for a vibrating-wire pressure, load, strain, or temperature sensor. The recommended frequency range is 1000 to 9900 Hz (up to 5000 Hz in the CR5000). Number of Vibrating-Wire Sensors Measured One vibrating-wire sensor connects to the AVW1. Additional sensors can be measured by using an AM16/32-series multiplexer. Vibrating-wire/strip transducers are measured by the VibratingWire Instruction in CRBasic, and by Instruction 28 (Vibrating Wire) in Edlog. The data logger produces a swept-frequency excitation, then measures a specified number of cycles of the sensor's resonant frequency. What is the measurement resolution, in Hertz, of the AVW1, AVW4, or AVW100? Do these interfaces have any certifications of compliance? The AVW1, AVW4, and AVW100 have a resolution of 0.1 Hz. Certifications of compliance for these items are not available. What is the difference between the AVW1 and the AVW100? The AVW1 is able to detect frequencies ranging from 1000 to 9900 Hz; the AVW100 is able to detect frequencies ranging from 250 to 9900 Hz.